This cover has an interesting history. who joined the Australian Flying Corps in World War I. After the war, Wilkins made scientific expeditions. In the 1920s, he pursued polar expeditions and set a goal to fly across the Antarctic. for an expedition to the Antarctic with two Lockheed Vega airplanes. of the American sponsors) expedition left New York on September 22, 1928.
on to the Hektoria, the whaling ship that was to be their exploration vessel. The Hektoria was supplied by the N. Bugge Hektor Whaling Co. of Norway. The next stop was Port Stanley in the Falklands. Stamp collectors were part of the financing arrangements for such expeditions. This cover was part of the plan. The use of an airmail envelope was meaningless. The cover probably was always part of the expedition's baggage. Port Stanley was where the first stamp was cancelled on October 28, 1928. The stamp is a Falklands Islands 1924 1d. dull vermilion King George V (SG 74). Their destination was Deception Island in the South Shetlands. Deception Island is a collapsed volcanic cone at the south end of the Shetlands. a flight across the Wedell Sea and along a tangent across Antarctica. Wilkins Antarctic Expedition handstamps on the cover. The Hektoria arrived at the whaling station at Deception Island on November 4, 1928. By November 16, one plane was flying and both were flown on November 26. The first Antarctic flight of 1,300 miles was made on December 20, 1928. A second flight was made on January 10, 1929.
to repeat and expand on their travels of the previous year. A trans-Antarctic flight was never in reach. 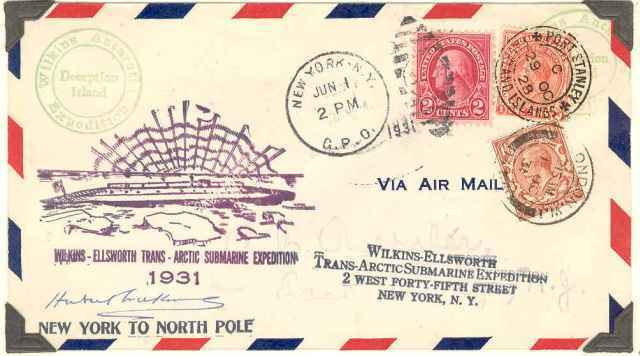 Next, Wilkins bought a surplus World War I submarine for $1 and planned an expedition to the Arctic. Lincoln Ellsworth, an American millionaire, provided financial help. Note the space left between the cachet and the handstamp for Hubert Wilkins' signature. The departure from New York City was noted by the New York City duplex cancellation June 1, 1931. The United States stamp was probably a 1926 2¢ carmine Washington rotary press (Scott 634). The submarine, however, broke down and the expedition was a failure. The intrepid explorers proceeded to London. The cover was next cancelled in London W. I. on October 1, 1931. The British stamp is a 1924 1d. scarlet King George V (SG 419). has been erased and replaced with a rubber stamp of the expedition's office in New York. More about Hubert Wilkins remarkable story can be found here.